Growing up in the south, there were many foods that made people say, “what???”. This is probably one of those. My mom was a good cook, but she didn’t cook often. Our family owned two restaurants when I was growing up, so we usually ate there. She only cooked on holidays or when my brother and sister were home. My memories of our usual dinner consisted of baked sweet potatoes, bbq from a local burger joint that had an outdoor smoker, or salmon patties. Every time I make these, I think of my mom. Heat 2 tablespoons olive oil and 1 tablespoon butter in frying pan. 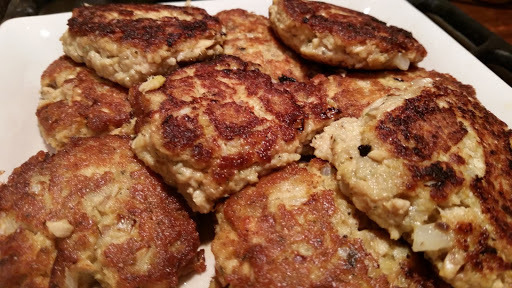 Form 3-4 tablespoons of the salmon mixture into round patties. Carefully place the salmon into the pan and cook for 2-3 minutes on each side until golden brown. One can will make 9 patties. 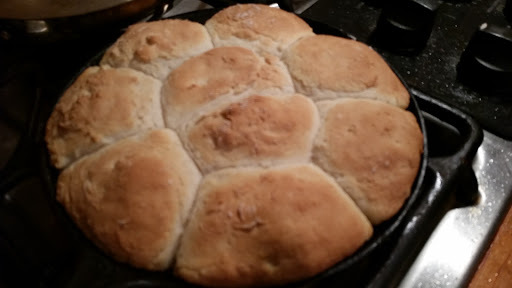 Homemade biscuits is almost a must with these…only because that’s what my mom did. My dear husband likes maple syrup on his??? I just want a buttered biscuit with mine. What recipes do you have that are peculiar to the way you grew up?